B.Sc. Hons. in Physiology is a 3-year undergraduate program with a specialization in Physiology and life sciences. The minimum eligibility criterion which most of the institutes ask for is a score of at least 50% (relaxable for reserved category candidates) at 10+2 or equivalent level. The average tuition fee charged for the course in Indian colleges/University ranges between INR 15,000 to 3.75 Lacs and depends upon the nature of college/institute (that is government, state/private/deemed) as well as its location. The course can be pursued by students after completion of their 10+2 or equivalent level education from a recognized state or central board. Those who have done diploma or any certification course after class 10th can also apply for the course (if they fulfill other eligibility criteria). B.Sc. Hons. in Physiology course admission involves Common Entrance Test (CET) based selection method as well as merit-based selection criterion that is the percentage of marks obtained at 10+2 or equivalent level by the candidate. Colleges and Institute that provide admissions through CET mechanism rely on the score of All India Level common entrance exams like AUCET, OUAT, CG PAT, NET, JNUEE etc while some of them go for a separate entrance exam of their own (like GB Pant University, GSAT, and MUET etc). Those institutes who do conduct an entrance exam provide due consideration to class 12th marks and performance in the entrance exam while considering the applications for admissions. B.Sc. Hons. in Physiology course provides holistic knowledge of animal and plant physiology to the bachelor level students that would help them to adjust to the job market as well as provide a platform for higher studies. It aims at providing a complete overview of all the aspects related to the subject. Candidates completing the course successfully can expect job offers ranging from INR 14,000 to 18,000 per month. 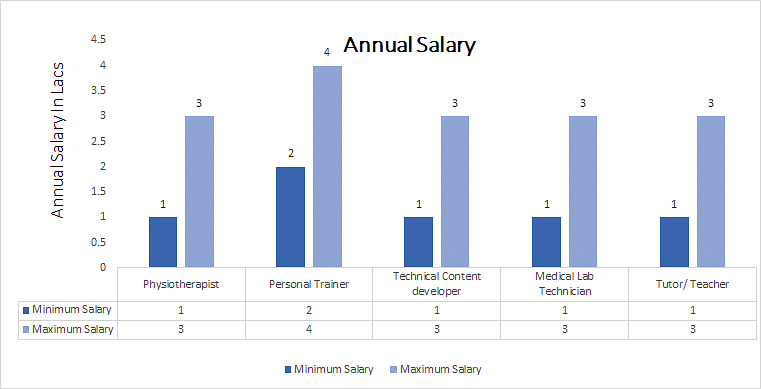 The annual salary in the industry goes beyond this average bracket with enhancement in the skill set and experience of the candidate. B.Sc. Hons. in Physiology: What is it About? Physiology is defined as the study of the organism, organ system, cells, bio-molecules etc. in a scientific manner. The domain of physiology encompasses biological study and analysis of various life forms with a special focus on human and animal life. B.Sc. Hons. in Physiology course aims at equipping students with all the required knowledge and skills in regards to life regulating process such as digestion, reproduction, muscle contraction etc. Graduation students are made aware of all the key organ system such as endocrine, gastrointestinal, sensory etc, during the course of their studies. There is a need for science and medical graduates to take up various roles at treatment and analysis level in the medical industry. B.Sc. Hons. in Physiology course transforms graduation students into a qualified workforce that is ready to take up various offered roles in the medical and treatment industry. B.Sc. Hons. in Physiology is offered as a course by a good number of colleges and universities across the country to candidates who have passed their 10+2 or equivalent level examination from a recognized state or central board. Candidate must have passed the 10+2 or equivalent examination from a recognized state or central board with at least 50% (relaxable for reserved category candidates) with Physics, Chemistry, Biology as a subject of studies. Institutes offering admissions through Common Entrance Test go for scores of JNUEE, AUCET, CG PAT, OUAT etc. To get admissions in these institutes candidates would have to qualify the respective entrance exam by securing minimum qualifying marks. Admissions to the course are done through common entrance test based admission process (as seen across various Universities and colleges in the country) as well as merit-based selection process (as seen in a good number of institutes/colleges). Students who have passed their 10+2 or equivalent level examinations with a minimum of 50% marks (relaxable for reserved category students) can make application in colleges offering the course. Majority of the Universities/Colleges conduct a common entrance test for admission into B.Sc. courses (like MUET, GITMA) or take admissions through commonly held entrance exam like NET. Hence students would have to make an application for such exams. After admission process final allotment of seats to the candidate takes place and the candidate is asked to deposit the fee for the course and register for the respective academic year. The syllabus of the course is divided into 6 semesters spread over a span of three years End Semester Exams being held after each semester. B.Sc. Hons. in Physiology syllabus consists of various subjects and domain-specific modules that students are taught during the course of their under graduation. The syllabus covers all the aspects related to Physiology and life science so, as to provide a holistic understanding of the subject to the undergraduate students. B.Sc. Hons. in Physiology: Who Should Opt for? Students who have interest in the study of life sciences. Those who have a career as a physiotherapist in mind. Those who have a career in medical research and development in mind. Those aiming at higher studies in the domain can opt for the course. Undergraduates in Physiology have plenty of options to choose from in terms of their career. One can choose to work with firms such as Biomedical firms, Hospitals & Clinics, Pharmaceutical, Research laboratories etc. To provide you a holistic view of the career prospects of the course we have tabled certain areas and the respective roles attached to the same where Physiology undergraduates can look for in terms of their career.